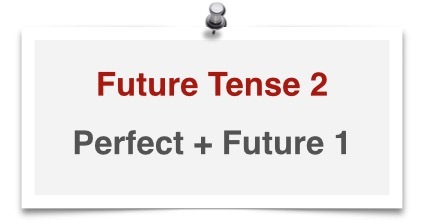 The future tense 2 is an infrequently used tense in German grammar. It is also not the simplest part of German grammar to form because you basically have to combine two grammatical time periods with each other. Sounds pretty complicated doesn’t it? That’s why I want to explain it to you in a simple, step-by-step manner. If you can grasp the principles and rules at the start, it won’t be so difficult when you come to use it. In a moment we’ll reshape the example sentence “Ich baue ein Haus” (I am building a house). As I already said, to do this we have to combine two different tenses with each other. In order to understand this a little bit better it’s perhaps wise to mention that in German the future tense 2 is also known as “vollendete Zukunft”. The word “vollendet” suggests to us that a past tense form is somehow incorporated: specifically here, the past perfect. In the diagram above you can see that the conjugated verb in the second position moves to the end of the sentence and is put into its past participle form (bauen=> gebaut). In the second position in the sentence you then put the auxiliary verb “haben” in its conjugated form (in this case “habe”). I have covered exactly how the perfect tense works in German in the corresponding site about the perfect tense. You have to make sure that the grammatically changed verb is in position 2 in the sentence. If the sentence is in the perfect tense, we have an auxiliary verb in position 2. In the example above we have the auxiliary verb “haben”. And this is exactly what we must do to reshape the sentence to be in the future tense. I have already explained the Rules for this in great detail. Just to remind ourselves: The conjugated verb in position 2 takes the infinitive form and is moved to the end of the sentence. In the newly empty position 2 you then put the conjugated form of the auxiliary verb “warden”. (I am sure that at the age of 40 I will have built a house). Because the future tense 2 is always formed using the perfect tense, you must make sure that you remember that not all verbs take the auxiliary verb “haben” in the perfct tense and that some use the verb “sein”. You can read about the verbs that use “sein” here. As you can see, the infinitive form of “haben” is not at the end of the sentence. Instead you have the infinitive form of “sein” because in the perfect tense “reisen” takes the auxiliary verb “sein”. These three example sentences are very realistic. When we are worried that something might have happened, the future tense 2 provides us with the perfect way to express ourselves. If you like this page and want to learn more about the power of mnemonics, please feel free to sign up with my absolutely FREE 5-Day-Video-Course "German Grammar for Your Brain". CLICK HERE to watch the first video right now. Which preposition uses which case? You will receive 5 Videos with superbe learning tips for FREE.